At the December 2018 Capital Markets Day, we reconfirmed our leverage framework, maintained at 3.5x to 4.5x Net Total Debt to Consolidated Annualized EBITDA ("net total leverage1"). In absence of any material acquisitions and/or significant changes in our business or regulatory environment, we intend to stay around the 4.0x mid-point through an attractive and sustainable level of shareholder disbursements. At December 31, 2018, our net total leverage ratio reached 4.1x versus 3.6x at September 30, 2018. The anticipated step-up in our net leverage ratio was fully attributable to the €598.9 million we paid out of the €600.0 million gross extraordinary dividend to our shareholders in early October 2018. In addition, we spent €87.3 million on share repurchases in Q4 2018 as part of the aforementioned €300.0 million Share Repurchase Program 2018bis. On a pro forma basis, reflecting the impact of the new IFRS 16 lease accounting standard, applicable as of early January 2019, our net total leverage would have remained broadly unchanged at 4.1x. Our net covenant leverage2, as calculated under the 2018 Amended Senior Credit Facility and which includes certain unrealized M&A-related cost synergies and excludes both lease-related liabilities and vendor financing-related short-term liabilities, reached 3.4x at December 31, 2018 (September 30, 2018: 2.9x) and mainly reflected the same impacts as mentioned above. 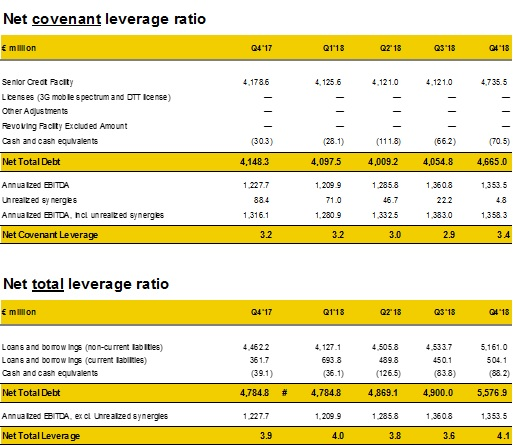 Our current net covenant leverage ratio is significantly below the springing maintenance covenant of 6.0x and the incurrence test of 4.5x net senior leverage. 1. Net total leverage is defined as the sum of all of the Company's short-term and long-term liabilities minus cash and cash equivalents ("Net Total Debt"), as recorded in the Company's statement of financial position, divided by the last two quarters' Consolidated Annualized EBITDA. 2. Net covenant leverage is calculated as per the 2017 Amended Senior Credit Facility definition, using Net Total Debt, excluding (i) subordinated shareholder loans, (ii) capitalized elements of indebtedness under the Clientele and Annuity Fees, (iii) any finance leases entered into on or prior to August 1, 2007, (iv) any indebtedness incurred under the network lease entered into with the pure intermunicipalities and (v) any vendor financing-related liabilities, divided by last two quarters’ Consolidated Annualized EBITDA including certain unrealized cost synergies related to the BASE and SFR Belux acquisitions.